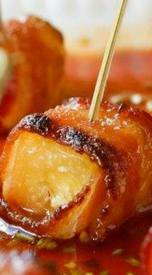 These Bacon Wrapped Pineapple Poppers in Honey-Sriracha sauce from The Stay at Home Chef are a perfect game day appetizer! Each bite is sweet and salty with just the right amount of heat. Simply said… they’re pretty incredible so make sure you have plenty on hand!